When in doubt – check your pockets again! 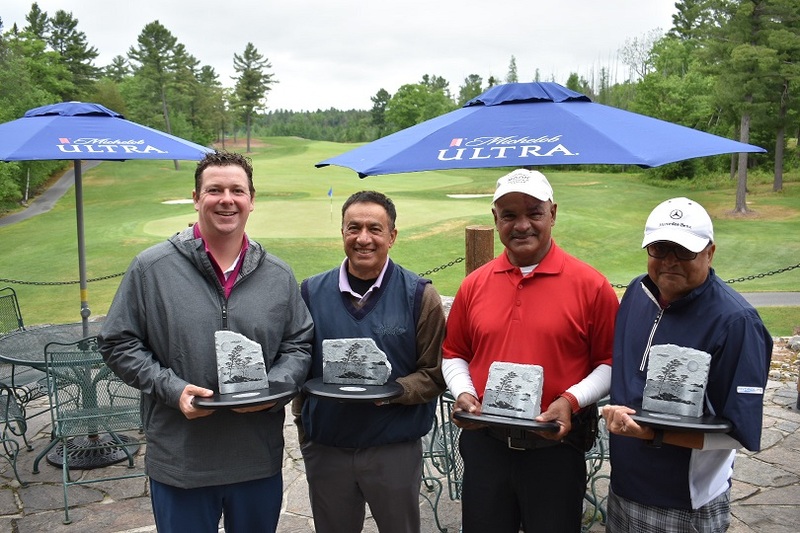 While the perennial favourites fell off the leaderboard at the 16th annual ClubLink Michelob Ultra Muskoka Pro-Am, a team from The Country Club finally found the keys to success. As they made the short drive from Rocky Crest Resort to Rocky Crest Golf Club from an early morning breakfast, The Country Club team of Lincoln Garraway, Remus Garraway, KC Sooklall and Dave Newsome, Director of Operations at The Country Club, had high hopes for round two of the Michelob Ultra Muskoka Pro-Am. The tournament newbies were sitting on an impressive two-stroke lead after carding a whopping team net score of 19-under par in a rainy and cool first round on Monday, June 4, but there were four teams at 17-under and one at 16-under that were all within strike in the field of 25 teams. At breakfast the team discussed their strategy for the final round . . . stay loose and have fun . . . but that didn’t last too long, at least for Remus Garraway who went to check for his car keys just before the shotgun start and could not find them. He knew they were at the golf course, he had driven over an hour earlier, but couldn’t find them anywhere. By tee off time, clubhouse staff were searching high and low, golf shop staff had been notified, while Remus had re-traced his footsteps with no luck. With temperatures hovering around 10 C for much of the round many players were bundled up, with more toques being worn than shorts. Turns out, Remus was wearing two jackets and the keys were tucked away in the second jacket. “We’re not going to let Remus drive when we come back here next year,” Lincoln said with a laugh at the end of the round and Remus pulled the keys out of his pocket for a photograph. “We really started to turn it on after Remus found his keys. That was a huge difference,” Lincoln added, noting they went 7-under over the final four holes including a pair of eagles on No. 7, their final hole of the day to get to 37-under par for the two rounds. “If he had found them earlier I think we could have been lower,” Remus added. 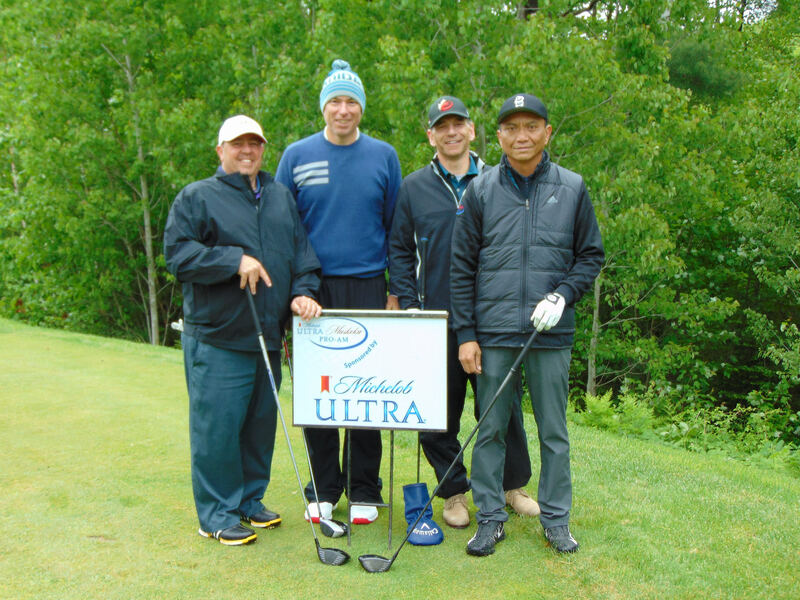 The boys each took home mini beer fridges to be stocked with Michelob Ultra and a $500 ClubLink gift card. The Country Club also stole the show in the shootout on No. 18 at the end of Day One after a four-way chip-off to determine the winner of a set of TaylorMade M3 irons on the line. Lincoln Garraway put his chip closest to the hole to win the irons followed by Chad Anderson from Greystone, Jordan Hutchinson from Cherry Downs and Jeff Knuth from King Valley rounded out the top four. A team from Cherry Downs including; Director of Operations, Joe Pacione, Marty Sullivan, Jordan Hutchinson and Ken Brace and a team from Dalewood GC including; Head Professional, Brad Pemberton, Terry Richards, Nathan Clarke and Kyle Quinn, finished T2 in the Michelob Ultra Flight, one stroke behind the leaders at 36-under par. While the top teams from Day One fought it out in the Michelob Ultra Flight for a two-day total score, lower teams had the option of moving down to the TaylorMade Flight for round two and eliminating their scores to create a level playing field. In that battle, a team from Wyndance GC lead by Director of Operations, Brad Sewards, playing alongside Danny Fatigati, Dinny Relacion and Frank Tralli came out on top with a final round score of 19-under par. Second place at 18-under went to a squad led by Rocky Crest Assistant Professional, Sterling Emery with Mike Wilk, Rick DeJager and Mike Brazeau, while a Glendale G&CC squad including Director of Operations, Matt Belacca, George Carvalho, Lou Arcari and Tony Belisario settled for third at 17-under. 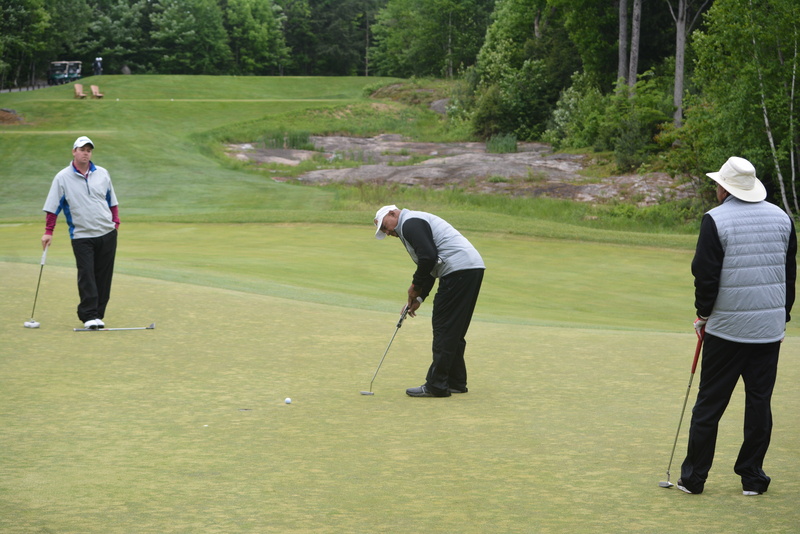 To be part of the next event on the ClubLink Signature Events Calendar, click here.